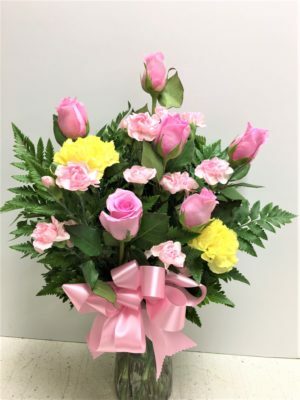 Pink flowers such as roses, carnations are beautifully designed in a clear vase and then, yes, the POP of yellow is added. 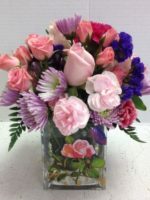 Brighten the Pink with this stunning pink floral arrangement with a POP of yellow! 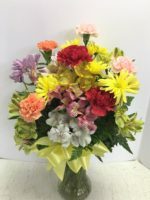 Custom designed for a very special customer, he chose all pink and then requested 2 yellow carnations to make the arrangement “bright’. 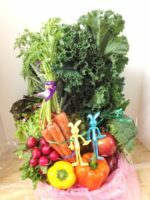 When we delivered it to his lady, she beamed from ear to ear! I’ll bet you smiled when you saw this arrangement, and well you should! You know your lucky recipient is going to be happy, too! Other happy flowers include our Happy Hawaiian Mix , Mini Roses and Happy Sunflowers and Happy Birthday Fun!